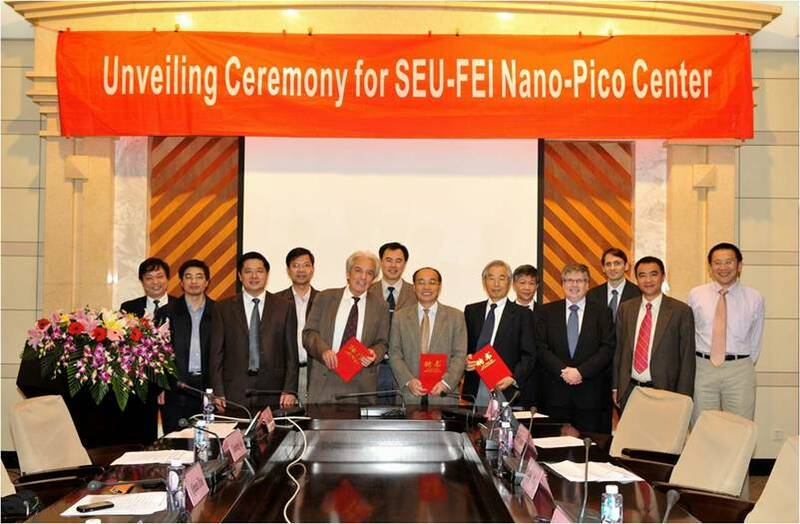 SEU-FEI Nano-Pico Center (NPC) was founded in spring 2009. Qiman Zhao, the vice president of SEU, Prof. Ze Zhang, Chairman of Chinese Electron Microscopy Society, together with Marc Peeters, VP of FEI company attended the Unveiling Ceremony of NPC. At the beginning, Prof. Litao Sun, the director of NPC, gave the brief introduction to the center. Qiman Zhao, on behalf of SEU, congratulated the foundation of the center. During the ceremony, Prof. Ze Zhang was appointed to be Chairman of Academic Committee of the center. What’s more, Prof. Albert Fert, Prof. Sumio Iijima, together with Prof. Zhonglin Wang were appointed to be members of International Advisory Committee. Prof. Qing-An Huang, Cheung Kong Scholar Professor and one of China National Funds for Distinguished Young Scientists , was invited to be Honary Director of the center.